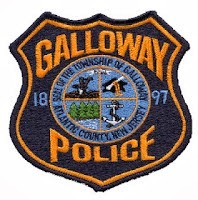 Galloway Township Police responded to 761 calls for service during December 22nd to December 28th, 2013. Additional statistics include: 3 Burglaries, 12 Motor Vehicle Accidents, 42 Tickets issued, 3 Driving While Intoxicated, 19 Arrests, 0 Domestic Violence, 11 Fire Calls, 86 EMS Calls and 0 Juvenile call. December 24 at Balboa Ave.
Bruce S. Seldon Jr., 19, of Galloway was arrested by Ofc. Jacqueline Crocker for possession of less than 50 grams of marijuana on December 22. Kenneth R. Epperson, 28, of Egg Harbor was arrested by Ofc. Pat Neal for obstruction and resisting arrest on December 22. Richard M. Long Jr., 26, of Egg Harbor Twp. was arrested by Det. Ryan Goehringer for burglary, theft and criminal mischief on December 23. Joseph P. Kovsh, 18, of Galloway was arrested by Det. Jason Kiamos for burglary and theft on December 24. Matthew R. Dunn, 27, of Galloway was arrested by Det. Ro Latoracca for burglary and theft on December 24. Francisco Castro-Mendoza, 32, of Pleasantville was arrested by Ofc. Vincent Ceci for DWI on December 25. Catherine Hahn, 57, of Hamilton Twp. was arrested by Ofc. Pat Neal for DWI on December 25. Alfonso Corpus, 73, of Mullica Twp. was arrested by Ofc. James Mullholland for DWI on December 27. Darrell L. Dixon, 38, of Hamilton Twp. was arrested by Ofc. Hiram Melendez for obstruction on December 27. Julia M. Clark, 19, of Galloway was arrested by Det. Jason Kiamos for burglary, theft and conspiracy on December 28.